Back cover blurb: Someone knows what really happened . . . On a cold December day, teenager Joy Enright is found drowned at the edge of a frozen pond. When an autopsy reveals she was strangled first, suspicion is thrown onto Martin,the young graduate who was last to see her alive. Someone who is prepared to keep their secret at any cost. In a small community, secrets are hard to keep and as the web of lies around Joy's life and death unravels, the truth will either bring one family closer together, or tear them further apart. 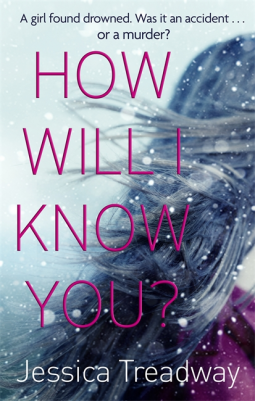 Suspenseful, engaging and shocking, How Will I Know You? will make you question everything you thought you knew about the ones you love. Harper doesn’t react the way everyone thinks she should when her best friend is murdered. She should be devastated but the truth is, they hadn’t gotten along too well recently. Joy had changed, fallen in with a girl that made everyone’s lives a misery, the usual pretty popular girl with a vicious streak. Harper knows more about Joy’s disappearance and subsequent murder than she’s letting on, she knows that Joy stole prescription drugs from Harper's Mum and was caught up in dealing. But even though they were no longer close, Harper can’t bring herself to betray her friend. Joy’s Mother also refuses to betray her daughter, knew she’s been arrested then let go for her involvement with drugs. But Joy’s Mother has her own secrets that she is desperate to keep hidden from the world, and doesn’t want her families name dragged through the mud. The local cops meanwhile are certain that they know who took Joy’s life and are determined to take the perpetrator down, despite the lack of evidence against him. There are those who believe in the accused's innocence and those who perceived he's as guilty as hell. One thing's for sure, in a town where everyone knows everyone justice will be served, and no secrets will remain hidden for long, no matter how hard people try to cover them up. How will I know you is available from 30 November 2017.